Functional Jaw Orthopedics is a term used to describe appliances that orthodontists use to affect the jaw and bone – not just the teeth. Orthodontics is a term associated with movement of individual teeth. Properly combining both techniques helps us to achieve more natural facial contours with a full smile, i.e., more pleasing facial aesthetics. Proper treatment can also lead to healthier temporomandibular joints (jaw joints). UPPER FRONT TEETH DON’T STICK OUT! It is a common misconception that protruding upper front teeth need to be pushed back. Twenty years ago, many times bicuspid teeth were extracted and headgears were used to help push the teeth back. The real problem was that the lower jaw needed to come forward. Even in the most severe overbite cases with protruding upper front teeth, the lower jaw (recessive mandible) is the main problem. The upper front teeth may only stick out 1 millimeter. The twin block is a great appliance to correct these problems. Non-extraction orthodontic treatment usually means non-extraction of bicuspids. This promotes a full, natural smile- what I like to call the “Hollywood” smile. The non-extraction treatment normally includes the six anterior teeth, two bicuspids per side upper and lower, and two molars per side upper and lower. This is what is usually referred to as non-extraction or 28 teeth. Very few people have room for 32 teeth (or 3 molars on each side). In expansion cases, the 3rd molars or “wisdom teeth” teeth are normally extracted in late teenage years due to lack of space for their eruption. In severe anterior-posterior crowded cases (when 3rd molars are present), an alternative is sometimes used to extract the 12year molar. This allows posterior teeth to move back easily, making room for crowded cuspids and bicuspids. 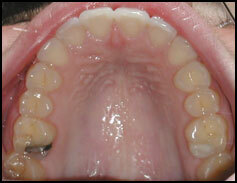 The 3rd molar is left alone and replaces the 12 year molar very adequately in most cases. Since 85% of chewing occurs in the 1st molar and 2nd bicuspid area, we are not as concerned that the 3rd molar erupts into a “perfect” position. The 3rd molar will normally erupt into a very acceptable position. Small adjustments can be made later which are rarely needed. This technique can be utilized in one posterior area to all four posterior areas, depending on the case. The patient still ends up with 28 teeth or a full “non-extraction” smile. This functional appliance does several things at the same time. It can widen the upper and lower jaw, which helps make room for the permanent teeth and prevent extraction of bicuspid teeth. It can help bring the lower jaw forward if it is recessive (back too far). It helps correct the overbite in two directions: anterior-posterior which orthodontists call overjet, and vertically which orthodontists call overbite. It is also an eating appliance so it isn’t accidentally thrown away on a lunch tray! It can be used in children, teens, and some adult cases. Same patient before and after shows how widening the smile makes room for the teeth without extracting bicuspids. Notice how we are able to make room for all the permanent teeth by combining an appliance (Functional Jaw Orthopedics) and braces. This type of treatment can also dramatically reduce the amount of time braces are needed. Many of our patients only need braces for one year or less. Anterior open bite refers to an increased opening in the front of the mouth which can cause several orthodontic problems. It can lead to increased wear of the posterior teeth, jaw joint problems, and speech irregularities. It can be caused by several factors including thumb sucking, tongue thrusting, and increased growth angle of the upper jaw to the lower jaw. If left untreated at an early age, jaw surgery could be needed as an adult. Some common treatments are done with functional jaw appliances, tongue cribs(to block the tongue and thumb), tongue reminders (bonded inside the anterior teeth), and even speech therapy can be effective in the growing child. It is best to consult with the Orthodontist as early as possible. The main fixed appliance we use is the mini-palatal expander. It can orthopedically widen the upper jaw and is fixed (or glued into the mouth). Variations can also be used on the lower jaw in some cases. It also helps prevent the extraction of permanent bicuspid teeth and contributes to a full, natural smile. There are many different variations of the removable and fixed appliances Dr. May uses for specific cases. Below is a modified version of the mini expander which can be used to help correct Class III malocclusions (underbite – where lower front teeth are in front of upper front teeth). This appliance is fixed (cemented in the mouth) and is used in conjunction with a reverse face mask (not a headgear). Underbites can be corrected as early as four years old, which helps to prevent severe problems later.